The senses of a person regarded as useless or unable to cope, specifically as the result of mental illness, and of a country that is unable to pay its debts or to feed its people came along shortly after the war. 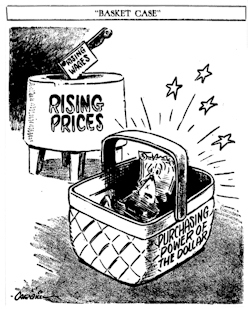 The first I’ve found is the title of a syndicated cartoon in January 1946 (above from the Hamilton Daily News Journal), commenting on the decline in value of the dollar. Both senses have continued to be widely known and used and have spread worldwide.